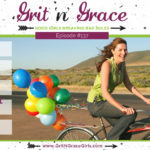 In a hilariously pathetic conversation, Amy and Cheri chronicle their objections, obstacles, and abject failures with rest. Thankfully, in a turn of the tide, they also give some simple but powerful solutions to their rest issues. If you want to laugh at two women with struggles instead of crying over your own, you’ll want to tune in. Misery loves company after all! 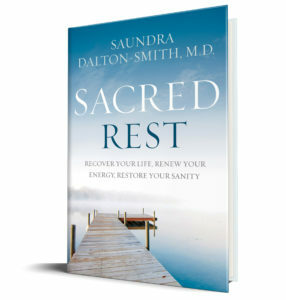 Dr. Saundra Dalton-Smith’s book: Sacred Rest: Recover Your Life, Renew Your Energy, Restore Your Sanity. Take Dr. Saundra’s “Rest Quiz”! Are you in a season of rest or chronic rest deficit? What “bad rule” would you write concerning rest? 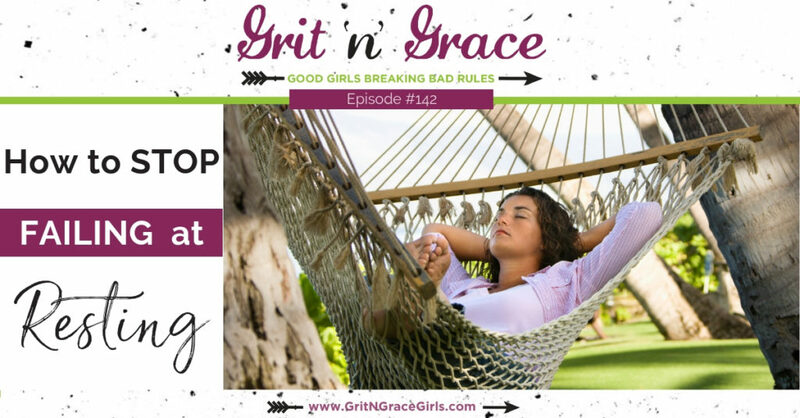 What steps from this week’s episode can you take to embrace rest? Cheri: So, Dr. Sandra talked about a chronic rest deficit. When have you experienced this? What does it look like and how long has it taken you to recognize it? Amy: Well let’s just say I’m in it right now. Usually Cheri we try to bring solutions to our listeners. Amy: And I will have to say that our show notes are sort of dismal today, so if this relates company [inaudible 00:01:21]. Amy: You think anybody is still listening? Cheri: I probably not. What I want to know is how is this possible, Amy? You just got back from a vacation. Come on. Amy: And so, because of our involvement, we had issues over vacation. So we didn’t get the … We got lots of sleep, and we had fun. Amy: We did have fun. But we didn’t get the spiritual and emotional and mental rest that we really needed. So I came back and now it’s just hard. I don’t think for me that it takes a long time to recognize when I’m in this place. I’m a margin girl, I try to preserve margin in my life. I love to be outside, I like to do craft projects or spray paint something gold. I’ve always got something like that going on, to create some margin, but I have a fairly small plate. So I start feeling it when the margin starts shrinking. But my problem is, I don’t know how to get out of it. Like I said, we’re supposed to have answers here. Maybe I’ll think of some while we talk. Cheri: Well, see, in here my brain is going in such a dysfunctional direction. I’m like, “See? This proves even vacation isn’t worth the time. Ha.” So instead of me being an empathetic friend who feels bad for you, I’m feeling vindicated. So yeah, I’m really … Well okay, we have got to just be really clear that probably I’m not the best person to be answering these questions today, because I woke up at 2:37 AM and did not go back to sleep. So the irony that we’re talking about rest on that kind of a day. As I was thinking about this whole chronic rest deficit, I realized I’ve cycled through it multiple times in my life and it’s usually been around some kind of a major family stress, like a death in the family or an illness, or a surgery, or a move, or somebody that’s been in crisis for a while and I’m the opposite. For me, it takes me forever to recognize the symptom. Even though the symptoms are obvious, like I’ll find myself procrastinating, but then I’ll just call myself lazy. Or I will start a whole bunch of new projects, even though I don’t have the energy to finish the ones I had already been doing and I just cut fun out of my life completely and then get completely grouchy and the only thing I try to do is catch up. So it’ll be months before I recognize this, unless somebody goes, “Cheri, do you see what you’re doing?” Then I’ll be like, “Oh, I’m doing it again, aren’t I?” And so now we have a name for it. Okay, so here’s the hope, Amy. There has to be hope here. We’ve talked about the pain, the problem. Here’s part of the solution, is recognizing where we’re at, recognizing that chronic rest deficit is a thing, and we don’t know much about how to deal with it but you know how to catch it early, but don’t know how to get out of it. For me, it’s even things like talking too fast, stomping around the house at a higher speed than I need to, tripping down my stairs because … All of this has to do with speed. Chipping dishes as I’m loading the dishwasher because, again, I’m moving just a little too fast. Forgetting things. Amy: Throwing the plates in. Cheri: No kidding. So that’s just a starter list that I know for myself. Something as basic, and I’ve been trying to be more conscious of this over the last day or two, is to just force myself to walk more slowly through the house because I’m not saving that much time, but if I’m going at that much of a breakneck speed that I’m literally falling or breaking things or bruising myself, then I’m filling myself with all the stress hormones and that’s not going to help me at all. Amy: Wow. Well so, if there’s truly no such thing as work life balance, which is what Dr. Sandra told us, there’s no such thing. Then what does harmony look like in your life? Tell us one instance when you feel you did experience that harmony? Cheri: What I really want to do now is crack a music joke about musical harmony, because, yeah, anything to distract from the actual question here. Cheri: Okay, so can I tell you two things that I’m experimenting with, that I think are going to move me towards harmony? The first one is one I have to keep circling back to, and that is putting an end to my work day. I know you are really good at this Meg, I’ve stayed with you and Barry and you guys do this. You have this evening routine where you both unwind. So I’m trying to get back into shutting things down, putting things away so that my evening doesn’t include work. A couple nights ago, Daniel came down and he had his guitar with him. He needed to practice a little bit for something he’s doing this weekend and I just hung out on the couch with him, and Dusty, our little black cat, curled up next to Daniel. Then Rafiki came and laid on me, and I just sat and petted? I stroked the cats for like half an hour while Daniel played and that was really nice and I slept really well that night and I’m like, “Okay, there’s something about that unwinding.” And it did include the harmony of listening to him sing and play, so that was kinda nice. But the other one is, I’m trying to set limits on how long I allow myself to work on projects. I used to have the strategy of, “I’m just going to keep working till I get it done.” But now I’m in the middle of juggling several projects, and so I have to be a better steward of my time and so I say, “I’m going to work on this for 30 minutes and then I stop.” Or, “I’m going to work on this for an hour and then I stop.” Because I can’t. I don’t have more time than that. So I’m slowly learning to accept that whole good enough idea that we recovering perfectionists make fun of. I’m learning to go with what I’ve got, and so far the sun still has risen each day. So it seems to kind of be working. How about you? How are you working towards harmony? Amy: Well, since I had to answer this question for this taping, these are some things I’m going to do. Cheri: You’re making promises. You know I have a good memory. I’ll check on you. Amy: Well, I love it. But we’ve had two interviews recently, including Dr. Sandra, that talked about silence and solitude and I thought, “I need to add some silence. I need to find the five minutes or whatever a day to be silent.” Because even with God, even with my time with God, I’m often chattering to Him. I want to examine my schedule and see how it is balanced out. I know she said there’s no such thing as balance, but mine really has been, for a long time, really out of whack I think, as far as the amount of work and commitments that I have because the work … All of our listeners I’m sure can totally relate to we wear so many hats, so the work is not just what we’re paid for. The work is our housework. The work is our church work. The work is all these things. And right now, I’m having to say no to friends all the time that are wanting to get together. It’s okay to say no some, but not as much as I’m saying it. Amy: We’ve just had a really exciting, blessed event happen in our family. My youngest son Nolan just got engaged. Amy: And so, one of the things I realized is it was really difficult to find a date to meet the new in-laws. Amy: That’s super important to me, you know? We’re going to have a whole new branch to our family. We’re so excited. So I thought, “There’s something wrong. I need to look at my schedule.” And then the last thing, and this is something I’ve been thinking about a lot, is that there are several situations where I need to get out of being in charge. I don’t need to get out of the whole thing. I need to learn to be a better follower. And this goes back to our infamous C word, because I realized how much grit this is going to take to not step back in charge, when I think things are not being done the way I think they should be done. So those are just a few things that I’m going to work on, to try to create more harmony. Cheri: Okay, so first of all they sound great. And second of all, I’m impressing them into my memory, so I can check in with you later. Cheri: What else are friends for? Amy: Well, Cheri, I know you’re not a nap fan. What is your biggest beef with rest? Cheri: Okay, my biggest beef with rest is it is annoying. Dr. Sandra said that it feels like a cop out to her, and I get that. I’m working on that, but what annoys me is that rest is this non-negotiable in my life. I know it’s good for me, but it takes so much effort that it feels like work. Actually, it feels worse than work, because I can force rest the way I can double down on work. The harder I try to rest, the worse I don’t rest. It’s just so unfair. I don’t like it, because I get an F in it, Amy. There you go. I fail it all the time. 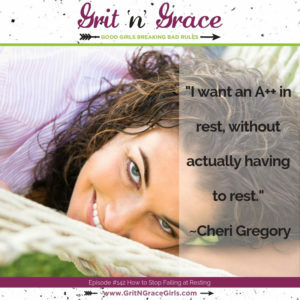 Cheri: I want an A++ in rest, without actually having to rest. What makes me mad is like last night, we go to bed. Daniel is out cold in 30 seconds, and I’ve got 30 minutes to an hour of tossing and turning and figuring out my pillow and trying to calm all the thoughts in my head, before I fall asleep. And then, I forgot to turn off the heater. And we both sleep better when it’s cold and so at 2:37 AM, you know the 2:37 AM club, I wake up and I’m boiling hot, and it’s not a hot flash this time. It’s the stupid heater. So I have to go all the way downstairs, trying not to trip over the cats, and I go back up again, and then I’m awake enough to realize my back hurts. So whine, whine, whine. And more whining. Rest is annoying. I wish it was easier, but yes, that’s my biggest beef with rest. Amy: Well okay, I want to pause just one moment and talk about menopause, or the theory of menopause. I know you said it wasn’t a hot flash last night, but this not sleeping during the night, I have asked my mom and my mother-in-law, “How did you let me get to this stage without warning me about this?” Because it is for real. Amy: You young things that are listening to us, first of all thank you, and second of all, you should know this. Terrible times are coming! That is not quite right. 50s, awesome in so many ways, but you will not sleep in your 50s. Cheri: Thank you, Amy, the encourager. Amy: Sure thing. So anyway, I think for rest, rest for me is a beef … That doesn’t sound right. Amy: My issue with rest is that it keeps me from putting checks on my to do list. One of the things that you just said that so resonated with me, I don’t feel like I’m this high achiever person or this big production person, I just like being done. Done is always the goal. I kind of always think I’ll rest when I’m done. Except, you know, it’s never done. And so rest has been hard, because it keeps me from getting done. Cheri: It’s an interruption to done. Amy: Yes. I really have to shift my mindset, that rest happens whether I’m done or not. I don’t know. Cheri: If rest was a friend, you’d break up with them. Right? You’d be like, “Get out of my way. Be gone.” Okay, you and I clearly need to pray. Our listeners need to pray for us that we will get our attitudes straight about rest. You know? We will invite our listeners to email us their best advice for a couple of girls who are really struggling with rest, because this is a real thing. We want to, we’re willing to. But there are real obstacles in here. There are real obstacles. Amy: Alright. So this is a place for real. Amy: That we need great conversation this week on the Facebook group, in the Facebook group about this because we need some solutions here. Cheri: I loved her whole. I love the whole recognition that true rest brings restoration. Like I love the word restoration as much as I’m not fond of rest. Just the four letters. Like it is a four letter word in my vocabulary. Thank you. But restoration, just like I hear, I hear music playing at the word restoration. So what restores you Amy? Amy: We can’t wait to rest for vacation. And as we’re talking I thought I’m going to make it to go, go into my next vacation rested because how fun would that be? But anyway, so what? Two of the things that I really have been trying to be serious about it for the last year is to truly take a sabbath and truly take one day of rest. And part of that is that I am not opening emails over the weekend in general, so on Sabbath, not at all. But even over the weekend, because I don’t know, emails keep me engaged, even if I’m not answering them and see emails are kind of like that check list because as they build up, see they’re not done. Oh my gosh, they’re so not done. How about you? Cheri: Deep breaths Amy, deep breaths. Amy: So it works for you. Come back from vacation there’s 10,000 emails. Cheri: It never ends. Well for me resto… Here’s the thing. For me restoration looks like finding a low gear. I’ve, I tend to be full speed or dead stop, but I really do have a lower gear and once I’ve shifted into it, I find that really restorative. A few months ago, Daniel planned a day where on the weekend and he took me to San Francisco when we went to golden gate park and he took some, some lawn chairs and blankets and his guitar and he told me to bring my computer if I wanted it, but, so we found this little hillside and golden gate park and it was our little hillside. And we just, we kind of put the blankets down in the chairs and he played and we, we sat there for like two, three hours and we could see people biking by and families walking and we just sat and watched and listened and talked and there was no agenda whatsoever. And I could just, I could just feel myself unwinding and I didn’t pull out my computer. I didn’t do anything except just be there. And it was really nice and it was really restorative. And I’d love to do it again. Amy: That’s amazing. And points for Daniel. Cheri: That’s right. You know, maybe we just need to call it by a different name, like calling it restoration. I don’t have any problems. It’s just the word rest, r-e-s-t, four letters. We’re just going to start using the longer word. It just sounds so much better. Amy: Yes, yes, yes. I agree. Well, I think one of the main things that we get concerned about is how this lack of rest affects our relationships. And you just gave such a positive example with you and Daniel, but one of the things Dr Sandra said was when a relationship that’s supposed to bless you, becomes a relationship you become defensive against because you feel like it’s taking from you. Then there’s an imbalance there between the work rest ratio that’s going on because our relationships should be restorative. So have you ever experienced this idea of a relationship? You’re defensive against a relationship because you feel like it’s taking from you. And what did you do about it? Cheri: You know, that took me back to when my kids were little because, you know, that’s a relationship where they take and take and take. And I mean that’s just what kids do. But I remember when they were little and I would just get so depleted from all the disciplining I had to do. And so of course I’d become grouchy and life became dismal and serious for all of us. And so I learned that I had to be real intentional about pulling out our favorite books and reading aloud so that we get back all onto the couch together and do my silly voices and, you know, my silly faces that I would make just to, to restore that harmony. I guess really it to pull back that word into the conversation to restore that because the kids weren’t going to do it, you know, that wouldn’t be appropriate for me to wait for them to then restore the balance because that’s not what happens in a parent child relationship. So I had to be the disciplinarian and then I had to be the one who restored the balance so that there was this positive step back into restoration. How about you? Amy: Well, I mentioned before that I’m just not having enough time with my friends. And one thing that I have done is I’ve decided that Fridays are for lunches. Amy: So, if someone asks me now, that has helped to say, okay, I could, yes, I could do that on Friday, you know, and then I feel like, well I’m not just sloughing off the work, but I know I don’t have any time for you. So that’s been good. And the thing is, is what, like tomorrow is a, is a lunch, actually I’m having a breakfast and then a lunch which is amazing. Cheri: So hang on, So you actually have, you have taken action and you have scheduled these two restoration breaks. Amy: And here’s what I know will happen because these are two amazing women that I love, is that I will come away from that and it’s kind of this, it will fuel me to look forward to the next time on Friday rather than continuing, continuing to feel this defensive, like it’s taken up my workshop. I’ll be like, oh wait, I can’t wait to be with, you know, whoever that next person is. So I have lunch with. So I’m excited about that. Cheri: Very cool. Very cool. Okay, so there’s some hope. There is some hope, there’s an action plan. I love it. Okay. So, we are making change Amy, we are making change. Amy: Absolutely. Oh, that was a little. Oh, that was a little uplift there, wasn’t it? Oh good. I’m sure all our listeners are like excited about that change. Cheri: We’re going to celebrate any form of project pro, any form of progress in this area. Amy: Yes. Yes. Do you want to skip that last question? Cheri: No, I think it’s a good one. Go ahead and go ahead and ask it. Amy: All right. How can we fix a life that looks good but that doesn’t feel good? Cheri: This is a great question. And I realized, and this is going to be another practical thing, so we actually do have a few takeaways for our listeners. I’m doing a calendar audit. When I schedule things on my calendar, I use different color coding, but I haven’t taken the time for a while to really look and see which colors are dominant and which colors are missing. And the thing I’ve never done that I need to do is establish a color for restoration. See that’s going to sound so much better than rest. So I’m going to, I’m going to establish color for restoration and that way I can look into, you know, I can do my calendar by the week and I can look and see where are all those blocks and if there’s not enough restoration and I’m one of those girls who need some transition time between events and I need some downtime, I need a little bit of a breather and I forget that I need to schedule that, you know, like I’ll book a bunch of meetings back to back or projects back to back and it’s like, no, it doesn’t work. Cheri, schedule in some restoration time. And then again, since I’m trying to end my work day earlier, again, I’m working on blocking it out, but making it color coded on your calendar so you can see it visually I think can make a real difference. Amy: I absolutely adore that idea. In fact, you know, one of the things that I learned about your book with Kathy Overwhelmed was it I don’t have a to do list so much anymore because I schedule my to do list on my calendar, but it totally makes sense to schedule your restoration time. So I love that. Amy: Well I want to do a little shout out here to the book that we just handed in the manuscript for called Exhale. Okay. How hilarious audience dove is the irony here, that We’ve written a book called Exhale. We always have to write what is our biggest challenge. We wrote a book called Exhale, but we can barely talk about rest. It’s just really interesting. Cheri: [inaudible 00:25:17] recovering from writing the book, I think we can cut ourselves a tiny bit of slack here. Amy: That’s true. That’s true. Except you’re rolling into writing your next book. So anyway, scheduled that restoration. Alright. So, just for those of you that have been listening for a while, or even if you know, you, you heard in the introduction that Cheri’s been saying for a while, lose who you’re not, love who you are. Live your one life. Well, that is the subtitle for Exhale and I think it’s a good note to end on here to talk about these three steps towards rests. So Lucy or not. First we have to identify the things that have to go. There is no rest if we keep doing all the things for all the people right now, I mean there’s just not so we have to got to lose a few things. And then we have to love who we are. We have to pinpoint what’s renewing to us because that’s an indicator that our creator made us to respond that way and we can choose that and rejoice in that and not feel like that. That’s being a slacker to do those things. So love who you are, live your one life well and that when we do those first two steps, then we’re able to lead a life or even our work is restorative because we’re choosing to invest in the right places to say to the wrong things, yes to the right things, and it just leads to a life that’s an Exhale. Cheri: I love it, and so the fact that you and I are both struggling a little bit with rest right now, it just means we need to go back to those first two steps. We need to lose who we’re not and love who we are. So it doesn’t mean we’re failing, it just means we need to circle back around again. Amy: There we go and highlight our own book. Amy: It’s coming girl, it’s coming. 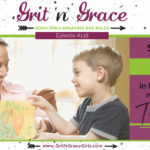 Cheri: All right, so what scripture have you paired with these two episodes? Amy: Oh, I just love this one. This is Isaiah 30:15 and it says, this is what the sovereign Lord, the holy one of Israel says, only in returning to me and resting in me will you be saved, in quietness and competence is your strength, but you would have none of it.Oh Gosh. Below rebuke at the end was for us. Cheri: So true. So what’s the bad rule? Amy: Rest damages my productivity. Cheri: But it does Amy. Well you just had to be so honest there. Fine, okay, so what’s the truth? What’s the fact we need to focus on instead? Amy: That trouble, okay. Rest improves every part of my life. Cheri: So now we have to act like we believe it. Amy: Yes and we have to take… because I think if we take action though, as if we believe it the after a while, we will believe it because it’s true. Cheri: Absolutely well, okay. 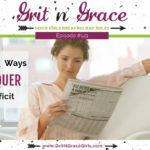 And so for me, here’s the grit. The grit is that little reprimand that you noticed at the end of the verse where God says, but you would have none of it because, I think yes, it could be perceived as a reprimand. But it could also be heard as a statement of longing and almost disappointment that God is waiting for us. That he wants restoration so that we can be the fullest, the fullest person that he created us to be. And that he knows what we’re missing out on when we don’t return to him in rest. And so the grit here is for me, is going to be to say, I know He knows better, and so lI’m going to behave as though rest improves every part of my life. And the restoration will come. 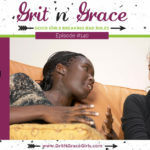 What’s the grace part? Amy: especially if you’re not sure you want what was in it and then, but then the third option of course is to get the gift to rip off the wrapping paper of the gift and to open it and enjoy the gift. And I think the grace is let’s rip open the gift and enjoy the gift that God’s given to us. Amy: Okay, you’re going to have to be the ray of sunshine in this one. I got nothing. Cheri: Good luck. I read your notes, I’m like, “Dang it!” We ain’t neither got nothing good to say. Amy: But I thought, well, we could joke about it right upfront. Cheri: We’ll just say this is going to be a very short episode, because we have nothing to say. Amy: So yes, if you would like solutions, you can turn us off now. If you’d like to hear us whine for a while, stay tuned. Cheri: If you’d like to hear from somebody who’s been awake since 2:37 AM because she couldn’t rest. Oops! Oh my goodness. All right. Well then, let’s just have at it, Amy. Sorry ’bout the mascara, Jane Ann … but so glad you joined in our hilarity!